Tan Family Chronicles: Isaac on radio! We won No Rhyme or Reason!!! So it was Friday the 13th of December 2013, and I was just leaving the house with the twins, to send them to the childcare centre when Isaac piped up "Mummy, can I follow you to send Asher and Shawna to school? I want to listen to No Rhyme or Reason! I want to win today!!!" That got me laughing "Sure, come along! We can TRY...."
We were barely driving for less than 15 minutes when the deejays Vernetta and The Flying Ducthman announced that they were going to start No Rhyme or Reason. I quickly called for Isaac to pay attention, as he was busy eating his breakfast. The given lines were announced "Fee Fi Fo Fum, I saw..." and you were supposed to complete the rhyme. Normally, the deejays would put on a song and answer the calls, but yesterday, they decided to go to the phone lines immediately to after announcing the given lines! Isaac, upon hearing the given lines, immediately started coming up with a rhyme. "Are you ready, Isaac? Can you remember your rhyme?" "Okay, I'm calling now, you have to say your rhyme yourself ah..."
DJ Vernetta Lopez:"Helloo Gold 90FM! Fee fi fo fum, I saw..."
Isaac:"Fee fi fo fum, I saw a girl having fun in the sun!" DJs Vernetta, The FD, and Brian Richmond all laughed and agreed to let Isaac win! Vernetta:"How old are you Isaac?" The deejays laughed again and one of them said "So you'd be listening to Gold 90FM for the next 50 years?" Then the FD got my details and said someone would contact me about the prize. By now, I had turned into one of the small roads just after the traffic light and we were safely stopped by the road. I was ecstatic! I know I know, it's super cheap thrill, but hey! How many people can say they've been on radio and won a good prize, eh? :p Well, technically it wasn't me, it was Isaac! I was very proud of him coz he made up the rhyme on his own, and presented it himself too! Excellent! Also, it was on such notice, he literally thought it up on the spot! Actually, I remembered his rhyme as "Fee fi fo fum, I saw a girl run and have fun in the sun!" from when he was rehearsing the line to himself before we got through the phone lines. But Isaac claims that when he was on air, he didn't say the "run" part. That's why he didn't write it down for me either (in the picture above). After he wrote it, he wrote his name. And he said "Hey, Mummy look, "Fee fi fo fum, I saw a girl having fun in the sun!" 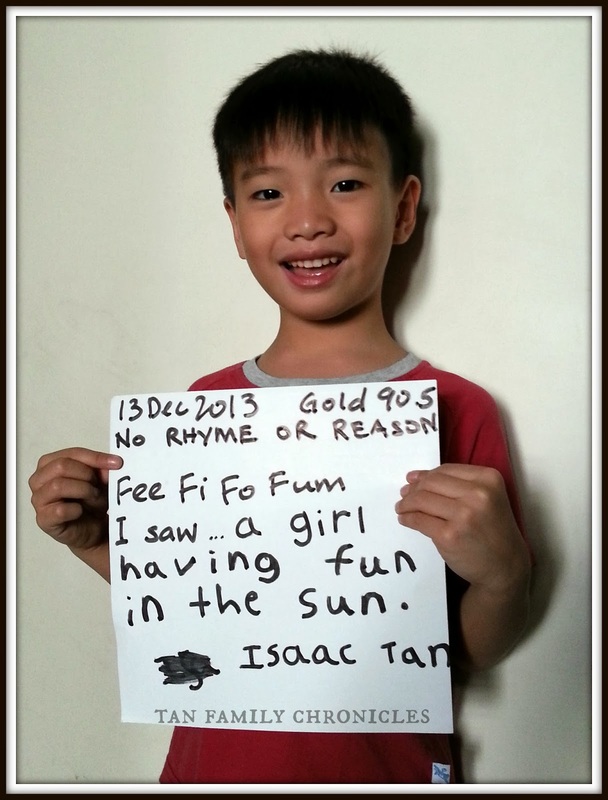 by Isaac Tan - the Tan rhymes with fun and sun!" Hahaha... yes indeed! Great job Isaac! Woohoo! Enjoy the Aquarium! Great job! I called in to 98.7FM when I was 15 and won tickets to a movie, but in the end I did not watch it.